In the middle of a journey to confirm infinity, we are entering the toughest phase now. Assuming a space like plasma mist, hydrogen and photon are drifting in the Mother Magnetic Vacuum Space where the polarity is very weak. It is Absolute-Rationality that can not be avoided even in such a scene, Absolute-Rationality defined as the attribute of the Mather Magnetic Vacuum Space can not act infinitely. There is a dilemma that predicts Absolute-Rationality's failure will accept infinite. Next time I will think about the collapse of another attribute Super - Symmetry. 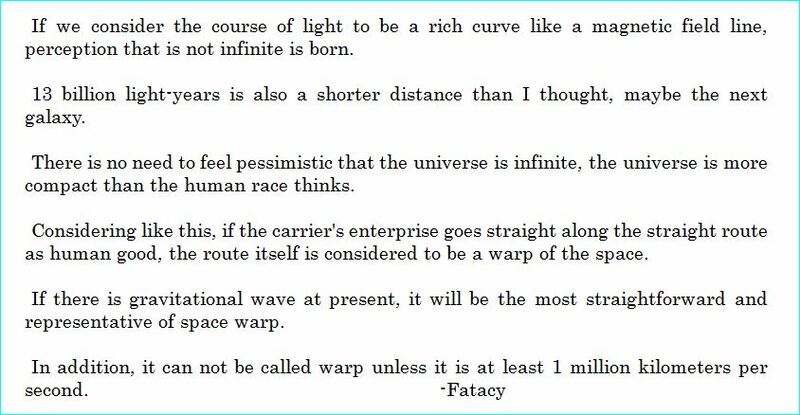 If we consider the course of light to be a rich curve like a magnetic field line, perception that is not infinite is born. 13 billion light-years is also a shorter distance than I thought, maybe the next galaxy. There is no need to feel pessimistic that the universe is infinite, the universe is more compact than the human race thinks. Considering like this, if the carrier's enterprise goes straight along the straight route as human good, the route itself is considered to be a warp of the space. If there is gravitational wave at present, it will be the most straightforward and representative of space warp. In addition, it can not be called warp unless it is at least 1 million kilometers per second.